The day dawns gray at the Motel 6, but Lan and Matt don't much care. They have a hangover. "I just want somebody to slap me," Matt jokes. Steve and Charles discuss whether to chase. It's a "slight risk" day. 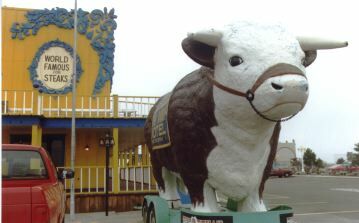 We decide to give it a shot, but first, a visit to an Amarillo landmark: The Big Texan. A colorful tourist trap, the restaurant-hotel-gift shop complex is designed to look like an Old West town. A elephant-size fake cow guards the front door. A sign tells us that if we can eat a 72-ounce steak in an hour, it's free! We don't have that kind of time. We head out in search of hailstorms. In the Blazer, Matt and I and two of the Germans split from the rest of the group in hopes of sampling some big hail in north Texas. On a desolate little farm road, we talk to a storm spotter. Then Matt calls a friend in Norman to get the latest data. It looks like the biggest hail is to our west, but we decide to see what we can see. We drive toward a storm that's all motion and "greenage," bilious and mean. We park on a side road and await the monster. It kicks up dust from the ground, at first, and Matt assures me that we're not looking at a tornado. It's a powerful gust front, and soon the car is rocking in fierce winds and horizontal rain. It looks like a hurricane is blowing by. When the worst is over, we make our way back on partially flooded farm roads to the highway and see a fence blown down near Vernon, Texas, and a tractor-trailer on its side on the highway, indicative of hurricane-force winds -- possibly 75 miles per hour. It obviously doesn't take a tornado to do damage. It turns out the rest of the caravan was caught in the winds, too. We meet them and drive on to Dallas, amid tornado warnings on the radio and yet another lightning show. It will take a few days for the atmosphere to replenish itself with moisture; until then, it's playtime in the big city. The grassy knoll looks a lot bigger on TV. We are doing the Dallas tourist thing, and I'm impressed by the history of the Kennedy assassination as put forth in the Sixth Floor Museum in the old book depository at Dealey Plaza. You can see the whole tableau from this vantage point, and, because it has been re-created so often in popular culture, it resonates strangely before the naked eye. We move on to the sky-high view from Reunion Tower, then shop at the Galleria. It's all very loud and glitzy and artificial after our days on the windswept plains. Still, the adrenalin hasn't completely worn off. At the Six Flags amusement park the next day, when Charles and Lan want a partner to join them in the bungee-type plunge in Dive Bomber Alley, I find myself saying yes and then spend the entire time leading up to the fall telling myself how crazy I am. We are tricked out in harnesses, hooked together and hoisted up 10 stories, very slowly. "I'm so scared," I squeak. Everything looks really, really tiny from up here. Fortunately, Lan is in charge of the rip cord. This is going to happen whether I want it to or not. By the time they've lowered us, readjusted us and hauled us back up again, I'm beyond fear. When Lan pulls the cord, there are a few seconds of free-fall terror and then the exhilaration of flying, as we soar out over the crowd and back again. The next morning, some of the Germans make friends with an officer from the Euless, Texas, police station. We're invited on a tour before we head back to Norman. Several in the group gleefully squeeze into a jail cell, under the baleful stares of real inmates. Charles is handcuffed, to everyone's amusement. This is what storm-chasers do in their off time? The following day, with the weather still annoyingly fair, we leave Norman for a visit to Wakita, Okla. If you've seen "Twister," you're familiar with Wakita as the home of Aunt Meg and the site of some nasty devastation. The filmmakers bought up part of the main street, fixed up some hail-damaged buildings and then knocked them down in a swirl of debris to mimic the passage of a tornado. Now, in a faux auto parts store that was the location office for the filmmakers, the "Twister" Museum shows visitors relics from the movie, including sculpture by Aunt Meg, a video of her house being destroyed (twice), and a shrine to Bill Paxton. (Apparently he made more friends than his co-star.) We also get to see one of the movie's original "Dorothy" machines, temporarily on loan to the museum. We're invited to take bricks from the last pile of debris on the street. I love a town that lets you take away its debris for absolutely no charge. We stop at some outlet stores on the way back to Norman so that the Germans can continue their quest for blue jeans. I walk to a neighboring wheat field and take pictures of the young, green stalks. They ripple in a gentle breeze. It's very quiet. And no storms are in sight.